Solitary unicameral bone cyst is a lesion sui generis. It bears no relation whatever to giant cell tumor of bone, and in particular it does not represent a cystic-healing phase of this tumor. Nor is it to be linked with enchondroma, fibroma or focus of fibrous dysplasia of bone that has undergone partial or extensive cystic degeneration. Further, it should not be regarded as representing cystic expression of osteitis fibrosa, since to throw it into this wastebasket category (one which to us is also meaningless) is to obliterate its distinctiveness. Correspondingly, solitary unicameral bone cyst ought no longer to be classed as an expression of localized fibrocystic disease of bone or localized fibrous osteodystrophy—likewise blanket designations dating from a more primitive era of bone pathology. What is the root cause of the UBC lesion? Does a genetic basis to the problem exist? Should pathologic fractures of the long bones (secondary to a UBC) be treated via immediate flexible intramedullary nailing? Answering these and similar questions will require a far more coordinated research effort than has been made to date. A multicenter study (a combined effort of the Shriner's Hospital System and the Pediatric Orthopaedic Society of North America) holds some promise of refining the treatment approach to a UBC. This article offers a comprehensive review of the present state of knowledge of a UBC, highlighting aspects of the pathophysiology, the clinical presentation, and the most commonly used treatment strategies. The anatomy that is relevant to UBCs is mainly that of the proximal humerus and proximal femur. Percutaneous approaches to the proximal humerus require the surgeon to avoid injury to the biceps tendon as well as the axillary nerve as it innervates the deltoid musculature. The standard deltopectoral approach is the most common open surgical approach for proximal humeral lesions. Key points of this approach include preservation of the cephalic vein as well as careful medial retraction of the conjoined tendon (coracobrachialis and short head of the biceps) to avoid injuring the musculocutaneous nerve. Dissection in the region of the bicipital groove should be minimized; such dissection may injure the anterolateral ascending branch of the anterior humeral circumflex artery, which provides the bulk of the blood supply for the humeral head. 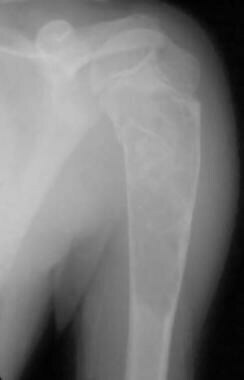 A UBC may appear in virtually any bone, but typically, it is found in either the proximal humerus or proximal femur. (See the images below.) A UBC often leads to thinning of adjacent areas of bone, such that fracture or pain from microfracture may occur. Large proximal humeral unicameral bone cyst demonstrates early cortical healing following pathologic fracture. Large unicameral bone cyst of pelvis. Pathologic fracture is depicted. Note extension of cyst into region of proximal femoral physis. When UBCs are immediately adjacent to a growth plate, they are referred to as active cysts, and when they have achieved some distance from the growth plate, they are considered to be latent cysts. This distinction has been used in the past; it was believed to have prognostic significance. A UBC usually presents as a unifocal (one bone) problem, affecting patients who are skeletally immature. Komiya and Inoue carried out a longitudinal study (with serial radiographs over 6 years) that documented the development of a UBC over time. Initially, a small erosive lesion of the endosteal humeral metaphysis appeared, and over time, the lesion progressively enlarged into a typical UBC. The lesion analyzed by these authors was somewhat unusual, in that it was located in the distal humerus. In addition, the lesion appeared following notation of a previous UBC in the proximal aspect of the same bone. The rarity of UBCs in adults supports a hypothesis of spontaneous resolution. In the absence of fracture through the cyst (or impending fracture), UBCs are asymptomatic. They are, at times, found serendipitously when radiographs are taken for other reasons. In the absence of symptoms and in the absence of mechanical compromise of the involved bone (eg, extensive cortical thinning), no treatment may be necessary other than observation. The precise relation between such rare instances of apparent malignant transformation and the thousands (if not millions) of UBCs that have not demonstrated such behavior remains unclear. At any rate, a UBC is not considered to be a malignant or premalignant lesion; accordingly, routine biopsy or other treatment of asymptomatic and nonproblematic lesions based on a patient's or family's fear of cancer should not be undertaken. The specific etiology of a UBC has not been elucidated. Many theories have been proposed. One commonly quoted theory was proposed in 1960 by Cohen,  who studied the cyst fluid from six children undergoing treatment for UBCs and found four to resemble plasma and two to resemble blood. Cohen proposed that the principal etiologic factor is blockage of the drainage of interstitial fluid in a rapidly growing and rapidly remodeling area of cancellous bone. Chigira et al studied the internal pressure of seven patients with UBCs and found them to be higher (2-7 mm Hg range) as compared to the contralateral normal bone marrow pressures. The arterial oxygen tension (PaO2) in the fluid from these same cysts was found to be impressively lower than that in venous or arterial samples taken at the same time. These authors suggested that venous obstruction within the bone appears to be a likely cause of such simple bone cysts. Shindel et al reported increased prostaglandin E2 levels in the cyst fluid from seven of their patients and theorized that this may help explain the beneficial effect of steroid injection of such lesions. Gerasimov led a group of Russian researchers who stressed that the fluid from UBCs possesses increased lysosomal enzyme activity regardless of the UBCs' status as active or latent. These authors emphasized the role such enzymatic activity might play in permanent corrosion of the cyst cavity, as well as increasing osmotic pressure within the cyst. High levels of cytotoxic oxygen free radicals have also been found in the fluid from UBCs. Such free radicals are not only cytotoxic; they might be generated during the ischemic state following blockage of interstitial fluid drainage from UBCs. The Japanese researchers suggested that such oxygen scavengers may contribute to the bone destruction associated with UBCs. Reproduction of these results in other centers has not yet occurred. More study in this area clearly is indicated, and the potential for future gene-based therapies is seemingly apparent. A UBC occurs most frequently in children aged 5-15 years (average age, ~9 years). [19, 20] Many authors consider cysts that present in the first decade of life to be more aggressive. [19, 20] A UBC affects males approximately twice as often as females. These lesions constitute approximately 3% of all bone tumors. The overall outcome and prognosis of a UBC is good. The lesion is believed to resolve spontaneously in most cases if given enough time. Cases that present to the orthopedic surgeon typically involve patients who demonstrate a combination of a cyst that has caused cortical thinning and the right stressful event (eg, being tackled while playing football). In general, treatment may be summarized as doing nothing more than trying to promote natural healing. Flexible intramedullary nailing may do nothing more than mechanically support the bone while the natural healing process occurs. Few comparative studies have been conducted regarding the various treatment alternatives for individuals with UBCs. [28, 29, 30, 31] Some of the more important ones are summarized below. In a retrospective study of 36 patients with UBCs who were surgically treated over a period of 45 years,  Farber et al found that curettage and bone grafting (with some patients receiving allograft and others receiving autograft) yielded a 53% (10/19) healing rate, whereas aspiration and injection with steroid yielded a 70% (12/17) success rate. In 25% (3/12) of the patients, only one injection was required. Although this difference in overall healing rates might appear clinically significant, it was not statistically significant. Farber et al also did not explicitly define their criteria for success. Because of the similar healing rates and the lower morbidity of the steroid injection, the authors concluded that they favored the percutaneous approach over traditional open curettage and bone grafting. In a retrospective review, Canavese et al compared the outcomes of percutaneous curettage, intralesional injection of methlyprednisolone, and intralesional injection of bone marrow. The three treatment groups included 46 patients with radiologically confirmed unicameral bone cysts and at least 2 years of follow-up. Results showed that the rate of satisfactory healing was 70% in the percutaneous curettage group, 21% in the bone marrow injection group, and 41% in the methylprednisolone group. Oppenheim et al evaluated 37 patients treated via open surgical techniques (35 with curettage and bone grafting and two with subperiosteal total or subtotal resection) against 20 patients treated via steroid injection. They found a 40% recurrence rate and a 15% major complication rate in their open group, whereas the steroid injection group had only a 5% recurrence rate and a 5% major complication rate. Although not calculated by the authors, this difference in recurrence rates was statistically significant (P <0.02 via the Fisher exact test). These same authors used reconstitution of cortical thickness as their endpoint of healing rather than cyst obliteration. Flexible intramedullary nailing of UBCs in long bones, though not a new concept by any means, has been reported to yield good results. [35, 36] Roposch et al documented a 94% (30/32) good response rate to flexible nailing of UBCs of the long bones. Complete cyst healing or healing with minor residual lucent areas occurred at an average of 36 months. Thus, this technique appears to support the compromised bone while the UBC follows its natural history and spontaneously resolves. Lagier R, Kramar C, Baud CA. Femoral unicameral bone cyst in a medieval child. Radiological and pathological study. Pediatr Radiol. 1987. 17(6):498-500. [Medline]. Virchow R. [On the formation of bony cysts] [German]. Ueber die bildung von knochencysten. Berlin, Germany: Monatsber d Kgl Akad D Wissenschaften. Sitzung der Phisikalischen-mathemat Klasse vom; 1876 12 Juni. 369-81. Jaffe HL, Lichtenstein L. Solitary unicameral bone cyst with emphasis on the roentgen picture, the pathologic appearance and the pathogenesis. Arch Surg. 1942. 44:1004-25. Bensahel H, Jehanno P, Desgrippes Y, Pennecot GF. Solitary bone cyst: controversies and treatment. J Pediatr Orthop B. 1998 Oct. 7(4):257-61. [Medline]. Komiya S, Inoue A. Development of a solitary bone cyst--a report of a case suggesting its pathogenesis. Arch Orthop Trauma Surg. 2000. 120(7-8):455-7. [Medline]. Stanton RP, Abdel-Mota'al MM. Growth arrest resulting from unicameral bone cyst. J Pediatr Orthop. 1998 Mar-Apr. 18(2):198-201. [Medline]. Grabias S, Mankin HJ. Chondrosarcoma arising in histologically proved unicameral bone cyst. A case report. J Bone Joint Surg Am. 1974 Oct. 56(7):1501-9. [Medline]. [Full Text]. Steinberg GG. Ewing's sarcoma arising in a unicameral bone cyst. J Pediatr Orthop. 1985 Jan-Feb. 5(1):97-100. [Medline]. COHEN J. Simple bone cysts. Studies of cyst fluid in six cases with a theory of pathogenesis. J Bone Joint Surg Am. 1960 Jun. 42-A:609-16. [Medline]. [Full Text]. Chigira M, Maehara S, Arita S, Udagawa E. The aetiology and treatment of simple bone cysts. J Bone Joint Surg Br. 1983 Nov. 65(5):633-7. [Medline]. [Full Text]. Gebhart M, Blaimont P. Contribution to the vascular origin of the unicameral bone cyst. Acta Orthop Belg. 1996 Sep. 62(3):137-43. [Medline]. Mirra JM, Bernard GW, Bullough PG, Johnston W, Mink G. Cementum-like bone production in solitary bone cysts (so-called "cementoma" of long bones). Report of three cases. Electron microscopic observations supporting a synovial origin to the simple bone cyst. Clin Orthop Relat Res. 1978 Sep. 135:295-307. [Medline]. Yu CL, D'Astous J, Finnegan M. Simple bone cysts. The effects of methylprednisolone on synovial cells in culture. Clin Orthop Relat Res. 1991 Jan. 262:34-41. [Medline]. Shindell R, Huurman WW, Lippiello L, Connolly JF. Prostaglandin levels in unicameral bone cysts treated by intralesional steroid injection. J Pediatr Orthop. 1989 Sep-Oct. 9(5):516-9. [Medline]. Gerasimov AM, Toporova SM, Furtseva LN, et al. The role of lysosomes in the pathogenesis of unicameral bone cysts. Clin Orthop Relat Res. 1991 May. 266:53-63. [Medline]. Komiya S, Tsuzuki K, Mangham DC, et al. Oxygen scavengers in simple bone cysts. Clin Orthop. 1994 Nov. (308):199-206. [Medline]. Vayego SA, De Conti OJ, Varella-Garcia M. Complex cytogenetic rearrangement in a case of unicameral bone cyst. Cancer Genet Cytogenet. 1996 Jan. 86(1):46-9. [Medline]. Vayego-Lourenco SA. TP53 mutations in a recurrent unicameral bone cyst. Cancer Genet Cytogenet. 2001 Jan 15. 124(2):175-6. [Medline]. Lokiec F, Ezra E, Khermosh O, Wientroub S. Simple bone cysts treated by percutaneous autologous marrow grafting. A preliminary report. J Bone Joint Surg Br. 1996 Nov. 78(6):934-7. [Medline]. [Full Text]. Lokiec F, Wientroub S. Simple bone cyst: etiology, classification, pathology, and treatment modalities. J Pediatr Orthop B. 1998 Oct. 7(4):262-73. [Medline]. Godette GA, Rooney RJ. Two different non-neoplastic lesions in the same long bone. Contemp Orthop. 1995. 30:395-98. Park IH, Micic ID, Jeon IH. A study of 23 unicameral bone cysts of the calcaneus: open chip allogeneic bone graft versus percutaneous injection of bone powder with autogenous bone marrow. Foot Ankle Int. 2008 Feb. 29(2):164-70. [Medline]. Glaser DL, Dormans JP, Stanton RP, Davidson RS. Surgical management of calcaneal unicameral bone cysts. Clin Orthop Relat Res. 1999 Mar. 360:231-7. [Medline]. Zenmyo M, Komiya S, Hamada T, Inoue A. A solitary bone cyst in the spinous process of the cervical spine: a case report. Spine. 2000 Mar 1. 25(5):641-2. [Medline]. Chaudhary D, Bhatia N, Ahmed A, et al. Unicameral bone cyst of the patella. Orthopedics. 2000 Dec. 23(12):1285-6. [Medline]. Abdelwahab IF, Hermann G, Norton KI, Kenan S, Lewis MM, Klein MJ. Simple bone cysts of the pelvis in adolescents. A report of four cases. J Bone Joint Surg Am. 1991 Aug. 73(7):1090-4. [Medline]. [Full Text]. Smith RW, Smith CF. Solitary unicameral bone cyst of the calcaneus. A review of twenty cases. J Bone Joint Surg Am. 1974 Jan. 56(1):49-56. [Medline]. [Full Text]. Farber JM, Stanton RP. Treatment options in unicameral bone cysts. Orthopedics. 1990 Jan. 13(1):25-32. [Medline]. Hou HY, Wu K, Wang CT, Chang SM, Lin WH, Yang RS. Treatment of unicameral bone cyst: a comparative study of selected techniques. J Bone Joint Surg Am. 2010 Apr. 92(4):855-62. [Medline]. Yildirim C, Mahirogullari M, Kuskucu M, Akmaz I, Keklikci K. Treatment of a unicameral bone cyst of calcaneus with endoscopic curettage and percutaneous filling with corticocancellous allograft. J Foot Ankle Surg. 2010 Jan-Feb. 49(1):93-7. [Medline]. Randelli P, Arrigoni P, Cabitza P, Denti M. Unicameral bone cyst of the humeral head: arthroscopic curettage and bone grafting. Orthopedics. 2009 Jan. 32(1):54. [Medline]. Canavese F, Wright JG, Cole WG, Hopyan S. Unicameral bone cysts: comparison of percutaneous curettage, steroid, and autologous bone marrow injections. J Pediatr Orthop. 2011 Jan-Feb. 31(1):50-5. [Medline]. Oppenheim WL, Galleno H. Operative treatment versus steroid injection in the management of unicameral bone cysts. J Pediatr Orthop. 1984 Jan. 4(1):1-7. [Medline]. Moreau G, Letts M. Unicameral bone cyst of the calcaneus in children. J Pediatr Orthop. 1994 Jan-Feb. 14(1):101-4. [Medline]. Imhäuser G. [Management of juvenile bone cysts using intramedullary nailing?] [German]. Z Orthop Ihre Grenzgeb. 1968 Oct. 105(3):110-1. [Medline]. Roposch A, Saraph V, Linhart WE. Flexible intramedullary nailing for the treatment of unicameral bone cysts in long bones. J Bone Joint Surg Am. 2000 Oct. 82-A(10):1447-53. [Medline]. Santori F, Ghera S, Castelli V. Treatment of solitary bone cysts with intramedullary nailing. Orthopedics. 1988 Jun. 11(6):873-8. [Medline]. Catier P, Bracq H, Canciani JP, Allouis M, Babut JM. [The treatment of upper femoral unicameral bone cysts in children by Ender's nailing technique] [French]. Rev Chir Orthop Reparatrice Appar Mot. 1981. 67(2):147-9. [Medline]. Kadhim M, Thacker M, Kadhim A, Holmes L Jr. Treatment of unicameral bone cyst: systematic review and meta analysis. J Child Orthop. 2014 Mar. 8(2):171-91. [Medline]. [Full Text]. Kadhim M, Sethi S, Thacker MM. Unicameral Bone Cysts in the Humerus: Treatment Outcomes. J Pediatr Orthop. 2016 Jun. 36 (4):392-9. [Medline]. Jordanov MI. 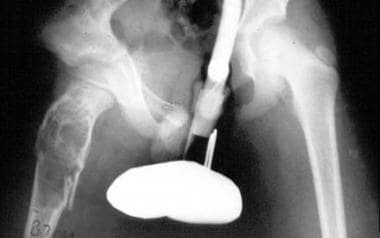 The "rising bubble" sign: a new aid in the diagnosis of unicameral bone cysts. Skeletal Radiol. 2009 Jun. 38(6):597-600. [Medline]. Capanna R, Campanacci DA, Manfrini M. Unicameral and aneurysmal bone cysts. Orthop Clin North Am. 1996 Jul. 27(3):605-14. [Medline]. Lodwick GS, Wilson AJ, Farrell C, Virtama P, Dittrich F. Determining growth rates of focal lesions of bone from radiographs. Radiology. 1980 Mar. 134(3):577-83. [Medline]. [Full Text]. Sundaram M, Totty WG, Kyriakos M, McDonald DJ, Merkel K. Imaging findings in pseudocystic osteosarcoma. AJR Am J Roentgenol. 2001 Mar. 176(3):783-8. [Medline]. [Full Text]. Reynolds J. The "fallen fragment sign" in the diagnosis of unicameral bone cysts. Radiology. 1969 Apr. 92(5):949-53 passim. [Medline]. Struhl S, Edelson C, Pritzker H, Seimon LP, Dorfman HD. Solitary (unicameral) bone cyst. The fallen fragment sign revisited. Skeletal Radiol. 1989. 18(4):261-5. [Medline]. McGlynn FJ, Mickelson MR, El-Khoury GY. The fallen fragment sign in unicameral bone cyst. Clin Orthop Relat Res. 1981 May. 156:157-9. [Medline]. Maas EJ, Craig JG, Swisher PK, Amin MB, Marcus N. Fluid-fluid levels in a simple bone cyst on magnetic resonance imaging. Australas Radiol. 1998 Aug. 42(3):267-70. [Medline]. Margau R, Babyn P, Cole W, Smith C, Lee F. MR imaging of simple bone cysts in children: not so simple. Pediatr Radiol. 2000 Aug. 30(8):551-7. [Medline]. Sullivan RJ, Meyer JS, Dormans JP, Davidson RS. Diagnosing aneurysmal and unicameral bone cysts with magnetic resonance imaging. Clin Orthop Relat Res. 1999 Sep. 366:186-90. [Medline]. Kaelin AJ, MacEwen GD. Unicameral bone cysts. Natural history and the risk of fracture. Int Orthop. 1989. 13(4):275-82. [Medline]. Campanacci M, Capanna R, Picci P. Unicameral and aneurysmal bone cysts. Clin Orthop Relat Res. 1986 Mar. 204:25-36. [Medline]. Neer CS 2nd, Francis KC, Marcove RC, Terz J, Carbonara PN. Treatment of unicameral bone cyst. A follow-up study of one hundred seventy-five cases. J Bone Joint Surg Am. 1966 Jun. 48(4):731-45. [Medline]. [Full Text]. Bovill DF, Skinner HB. Unicameral bone cysts. A comparison of treatment options. Orthop Rev. 1989 Apr. 18(4):420-7. [Medline]. Hecht AC, Gebhardt MC. Diagnosis and treatment of unicameral and aneurysmal bone cysts in children. Curr Opin Pediatr. 1998 Feb. 10(1):87-94. [Medline]. Wright JG, Yandow S, Donaldson S, Marley L. A randomized clinical trial comparing intralesional bone marrow and steroid injections for simple bone cysts. J Bone Joint Surg Am. 2008 Apr. 90(4):722-30. [Medline]. Altermatt S, Schwöbel M, Pochon JP. Operative treatment of solitary bone cysts with tricalcium phosphate ceramic. A 1 to 7 year follow-up. Eur J Pediatr Surg. 1992 Jun. 2(3):180-2. [Medline]. Carrata A, Garbagna P, Mapelli S, Zucchi V. The treatment of simple bone cysts by topical infiltrations of methylprednisolone acetate: technique and results. Eur J Radiol. 1983 Feb. 3(1):3-8. [Medline]. Clayer M. Injectable form of calcium sulphate as treatment of aneurysmal bone cysts. ANZ J Surg. 2008 May. 78(5):366-70. [Medline]. Spence KF Jr, Bright RW, Fitzgerald SP, Sell KW. Solitary unicameral bone cyst: treatment with freeze-dried crushed cortical-bone allograft. A review of one hundred and forty-four cases. J Bone Joint Surg Am. 1976 Jul. 58(5):636-41. [Medline]. [Full Text]. Neer CS, Francis KC, Johnston AD, Kiernan HA Jr. Current concepts on the treatment of solitary unicameral bone cyst. Clin Orthop Relat Res. 1973 Nov-Dec. 97:40-51. [Medline]. Fahey JJ, O'Brien ET. Subtotal resection and grafting in selected cases of solitary unicameral bone cyst. J Bone Joint Surg Am. 1973 Jan. 55(1):59-68. [Medline]. [Full Text]. McKay DW, Nason SS. Treatment of unicameral bone cysts by subtotal resection without grafts. J Bone Joint Surg Am. 1977 Jun. 59(4):515-9. [Medline]. [Full Text]. Scaglietti O, Marchetti PG, Bartolozzi P. Final results obtained in the treatment of bone cysts with methylprednisolone acetate (depo-medrol) and a discussion of results achieved in other bone lesions. Clin Orthop Relat Res. 1982 May. 165:33-42. [Medline]. Komiya S, Minamitani K, Sasaguri Y, et al. Simple bone cyst. Treatment by trepanation and studies on bone resorptive factors in cyst fluid with a theory of its pathogenesis. Clin Orthop. 1993 Feb. (287):204-11. [Medline]. Capanna R, Dal Monte A, Gitelis S, Campanacci M. The natural history of unicameral bone cyst after steroid injection. Clin Orthop Relat Res. 1982 Jun. 166:204-11. [Medline]. Fernbach SK, Blumenthal DH, Poznanski AK, Dias LS, Tachdjian MO. Radiographic changes in unicameral bone cysts following direct injection of steroids: a report on 14 cases. Radiology. 1981 Sep. 140(3):689-95. [Medline]. [Full Text]. Mitchell EP, Fugle MJ, Limbert AB. The treatment of unicameral bone cysts with injections of methylprednisolone acetate: a case study and review of the literature. J Am Osteopath Acad Orthop. 1983. 2:19-23. Scaglietti O, Marchetti PG, Bartolozzi P. The effects of methylprednisolone acetate in the treatment of bone cysts. Results of three years follow-up. J Bone Joint Surg Br. 1979 May. 61-B(2):200-4. [Medline]. [Full Text]. Thawrani D, Thai CC, Welch RD, Copley L, Johnston CE. Successful treatment of unicameral bone cyst by single percutaneous injection of alpha-BSM. J Pediatr Orthop. 2009 Jul-Aug. 29(5):511-7. [Medline]. Pavone V, Caff G, Di Silvestri C, Avondo S, Sessa G. Steroid injections in the treatment of humeral unicameral bone cysts: long-term follow-up and review of the literature. Eur J Orthop Surg Traumatol. 2014 May. 24 (4):497-503. [Medline]. Rosenborg M, Mortensson W, Hirsch G, Sisask G, Karlsson A. Considerations in the corticosteroid treatment of bone cysts. J Pediatr Orthop. 1989 Mar-Apr. 9(2):240-3. [Medline]. Capanna R, Albisinni U, Caroli GC, Campanacci M. Contrast examination as a prognostic factor in the treatment of solitary bone cyst by cortisone injection. Skeletal Radiol. 1984. 12(2):97-102. [Medline]. Garg NK, Carty H, Walsh HP, Dorgan JC, Bruce CE. Percutaneous Ethibloc injection in aneurysmal bone cysts. Skeletal Radiol. 2000 Apr. 29(4):211-6. [Medline]. Adamsbaum C, Kalifa G, Seringe R, Dubousset J. Direct Ethibloc injection in benign bone cysts: preliminary report on four patients. Skeletal Radiol. 1993. 22(5):317-20. [Medline]. Killian JT, Wilkinson L, White S, Brassard M. Treatment of unicameral bone cyst with demineralized bone matrix. J Pediatr Orthop. 1998 Sep-Oct. 18(5):621-4. [Medline]. Yandow SM, Lundeen GA, Scott SM, Coffin C. Autogenic bone marrow injections as a treatment for simple bone cyst. J Pediatr Orthop. 1998 Sep-Oct. 18(5):616-20. [Medline]. Akram M, Farooqi FM, Shahzad ML, Awais SM. A comparison of treating Unicameral bone cyst using steroids and percutaneous autologous bone marrow aspiration injection. J Pak Med Assoc. 2015 Nov. 65 (11 Suppl 3):S156-9. [Medline]. Wientroub S, Goodwin D, Khermosh O, Salama R. The clinical use of autologous marrow to improve osteogenic potential of bone grafts in pediatric orthopedics. J Pediatr Orthop. 1989 Mar-Apr. 9(2):186-90. [Medline]. Delloye C, Docquier PL, Cornu O, et al. Simple bone cysts treated with aspiration and a single bone marrow injection. A preliminary report. Int Orthop. 1998. 22(2):134-8. [Medline]. Köse N, Göktürk E, Turgut A, Günal I, Seber S. Percutaneous autologous bone marrow grafting for simple bone cysts. Bull Hosp Jt Dis. 1999. 58(2):105-10. [Medline]. Zhao JG, Wang J, Huang WJ, Zhang P, Ding N, Shang J. Interventions for treating simple bone cysts in the long bones of children. Cochrane Database Syst Rev. 2017 Feb 4. 2:CD010847. [Medline]. Fillingham YA, Cvetanovich GL, Haughom BD, Erickson BJ, Gitelis S. Bioceramic bone graft substitute for treatment of unicameral bone cysts. J Orthop Surg (Hong Kong). 2016 Aug. 24 (2):222-7. [Medline]. [Full Text]. Gupta AK, Crawford AH. Solitary bone cyst with epiphyseal involvement: confirmation with magnetic resonance imaging. A case report and review of the literature. J Bone Joint Surg Am. 1996 Jun. 78(6):911-5. [Medline]. Malawer MM, Markle B. Unicameral bone cyst with epiphyseal involvement: clinicoanatomic analysis. J Pediatr Orthop. 1982 Mar. 2(1):71-9. [Medline]. Typical appearance of cyst fluid is depicted. Initial aspiration often yields thin, clear, yellow fluid that rapidly becomes blood-tinged. Double-cannula technique demonstrates intraoperative use of contrast material for evaluation of cyst's interior. In this case, large partial septum remains along inferior portion of cyst.